In Part Three of the Godfather trilogy, Al Pacino’s character, Michael Corleone, expresses a deep desire to break free from the Cosa Nostra, which had consumed much of his adult life. Unfortunately, for Michael, he is pulled back into the vicious life of crime, never able to escape. In much the same way as the godfather’s plight, I too, find my presence demanded, as my expertise and knowledge in the iron game is constantly sought after. Although I am always happy to contribute to this world of muscle and steel that I love, I do at times find it consuming much of my free time. In March of 2008, while shopping at a local supermarket, I had the pleasure to run into a former member of my gym named Phil “The Beast” Thompson. Phil was one of my gym’s original members and was hard-core to the bone. During his younger years at my club, he trained intensely and I could see that he was still very much into bodybuilding. Phil told me he was a high school football coach on the Island at St. Joseph By The Sea and asked me if I would one day like to participate in helping the football team. I said, “Sure,” and several weeks later received a phone call from Phil requesting my assistance during a powerlifting meet between his school’s football team and three other high schools. On the day of the competition, I arrived at St. Joseph By The Sea early and reminisced about times past, when I was once a senior at New Dorp High School and occasionally took the five-mile bus ride from my school to hangout with friends at the former all-girl school. That was thirty-five years ago. Today, St. Joseph By The Sea has become a co-ed school with a winning football team destined for greatness. I met with Phil and took a tour of the team’s weight training facility. I was impressed to say the least. So much had changed since my high school days when the only pieces of equipment to train on were an old Universal Machine and a sit-up board. The weight room at St. Joseph By The Sea was well-designed with rows of benches, machinery, and racks of heavy steel. It was equipped for results and I thought to myself how lucky the team was to have such a state-of-the-art training facility as well as coaches that believed in the benefits of weight training. 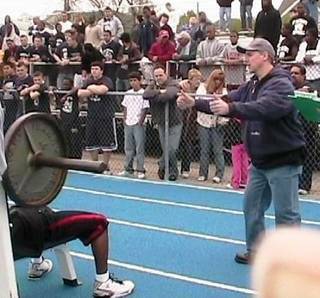 As I walked through the weight room, I also recalled how my high school’s football coaches were mistakenly against heavy weight training while I was a student. This in itself was the main reason I never participated in team sports. Being a new generation however, I was happy to give back to the community that had been so supportive of me during my reign. At the competition, I participated as the sole judge for the eager lifters. They came to match their strengths and wills with the dozens of other high school athletes that strained for top honors. It was great to see the hunger and hope in the young eyes of the players and it reminded me of my own burning desire so long, long ago. This was the next generation of iron warriors and to them the world seemed for the taking. The lifting on this day was fierce and intense, and judging the athletes was a pleasure as the crowd cheered loudly from the bleachers for their favorite lifters. 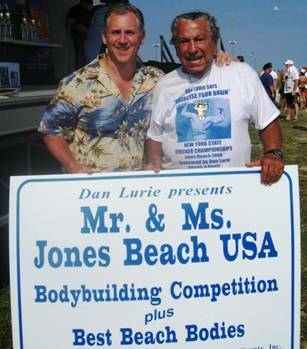 Later that same year, I had the privilege to participate as a judge in Dan Lurie’s first annual muscle beach show at Jones Beach. The show was a benefit to help raise money and awareness for the crippling disease of cerebral palsy. I was more than happy to contribute my time to such a worthy cause. It was great to be once again participating in a Dan Lurie sponsored event. It had been many years since I was last involved with Dan’s World Body Building Guild and on this day it was like old times, as the “85 years young” bodybuilding legend displayed his relentless humor and quick wit to charm the crowd of hundreds. It was a perfect day that made everyone, including the competitors, relax and have fun as they all united for an important cause. Nature provided some glorious weather. Rays of sunshine provided hope to all those present for this important event. These two events, like so many before, found me in one of the many roles within the bodybuilding spectrum. For years, I had trained and accumulated a wealth of knowledge to share. Now, decades after I first began to train, my time has come to pass on the torch to future generations, in hopes that perhaps some unique individuals might go the distance in the iron game. No matter what event it may be; whether it is a physique competition, a lifting meet, a seminar, or a charity function, I will always be there as a guiding light, planting the seeds of health, strength, and fitness whenever I can. In the end, this is what’s important. To give back so that some lives might be better, and just maybe in return, our country’s future as well. Who knows, with a little time and care, nature might produce a fine harvest.